The days are getting longer…I’m not sure how I feel about it at the moment. I’m a person who loves the night, even know I still don’t think there are enough hours in a day to get things done. So with this time change and “spring” trying to show it’s way into Minnesota, I’m all turned around. 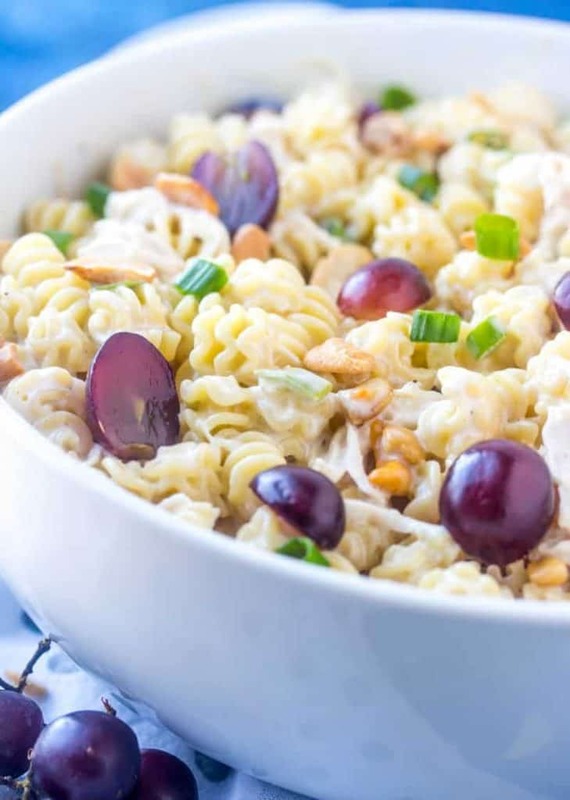 This Cashew Chicken Pasta Salad recipe is a family favorite. We’ve been making it for years and this is one salad that I always bring along to family get togethers. 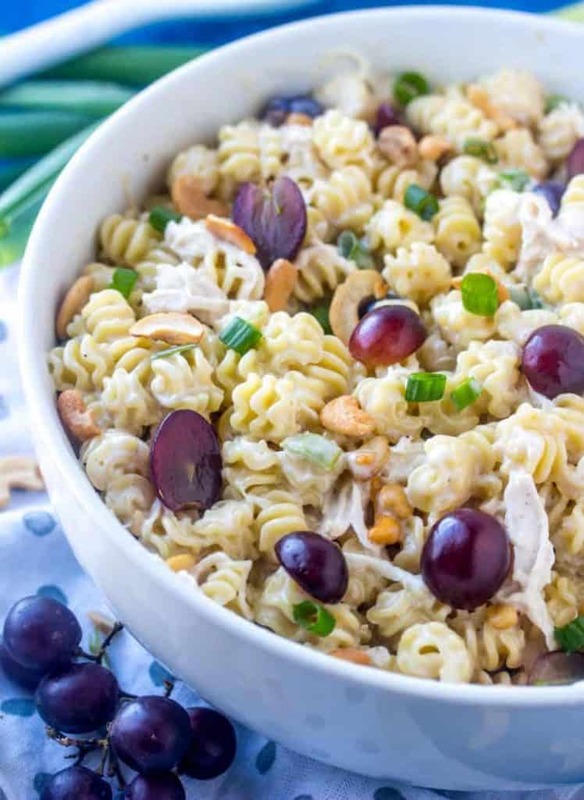 Not only is it easy, its filled with shredded chicken, red grapes, cashews and green onions. 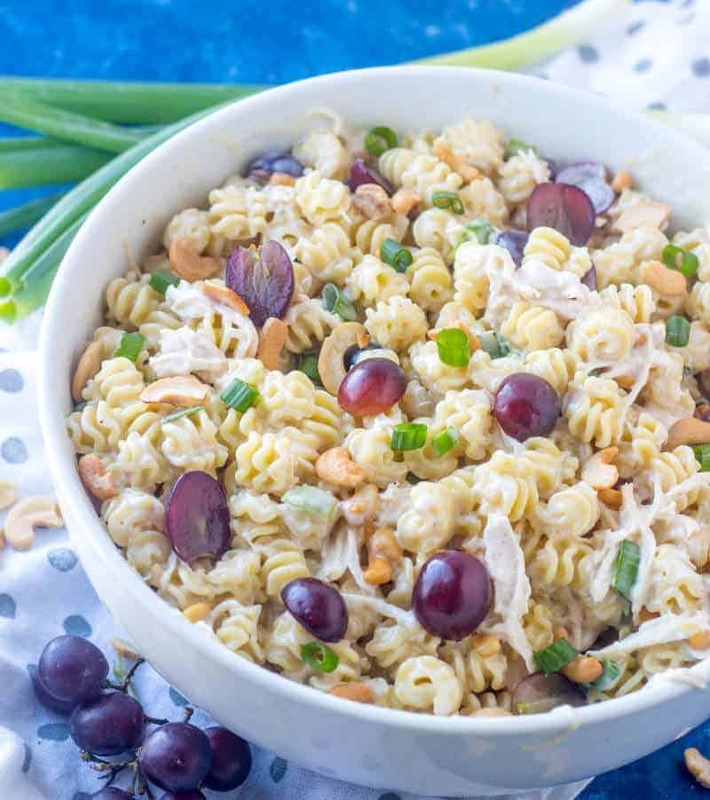 The sweet and savory combination works amazingly and this chicken pasta salad is more addicting than anything. 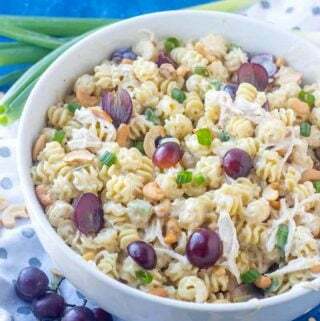 So this is comparable to my Best Chicken Salad recipe, I use brown sugar and regular sugar in it, but with this pasta salad I added some cashews instead of almonds and threw in some pasta. We originally had this salad when my mother-in-law recreated one from one of our local delis and let me tell you, it has become a family favorite and I could just eat my weight in this stuff. Once you try it, it’s one of those salads that you won’t want to stop eating. The different textures and flavors really make the whole thing pop. You’ve got crunch from the cashews, grapes and onions. And you cave the creamy and chewy from the pasta, chicken and dressing. I live off of pastas that are chalked full of goodness and this Cashew Chicken Pasta Salad does not disappoint one bit. It’s so good even my picky kids will eat it. And let me tell you, I live with a peanut of a 4 year old that could live off of hot dogs, string cheese and meat sandwiches if she had her choice. Luckily this salad is one that she will inhale, so it has become a regular on our menu. And since the warmer weather is finally trying to peak it’s head around the corner, there is no shortage of this in our house. So if you want that PERFECT salad to bring to your next potluck, holiday gathering or just because you’re in the mood for some good wholesome tastiness then you have to whip up this Cashew Chicken Pasta Salad, no brainer my friends! YOU MIGHT ALSO LIKE: Southwest Chicken Pasta Salad, Mock Crab Leg Salad, Mojito Pork Chops. 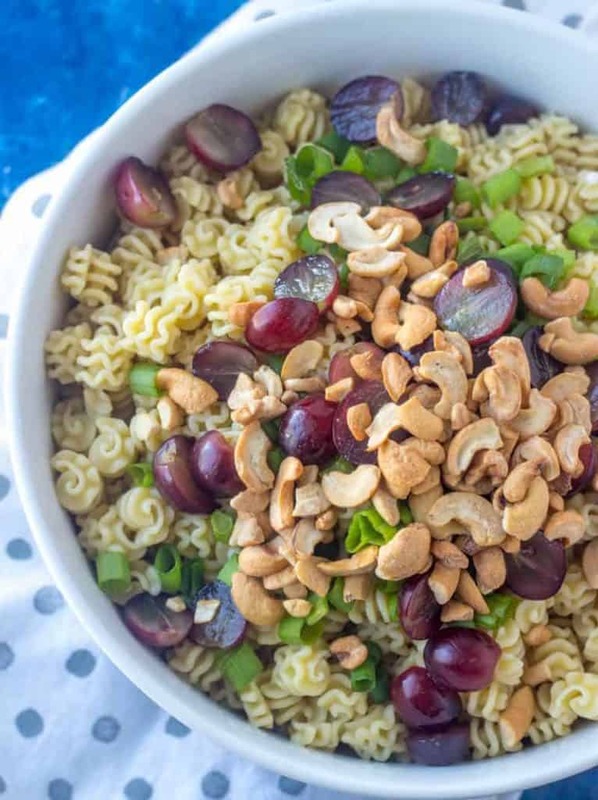 In a large bowl mix together past, chicken, green onions, grapes and cashews. In a smaller bowl whisk together mayo, milk, sugars, seasoning salt, salt and pepper. Add pasta to bowl with chicken and drizzle dressing over top and toss to combine.